Peptides can be labeled using a variety of methods depending on their amino acid composition. The N-terminal amine can be labeled if no internal Lys residues are present in the peptide. The C-terminal acid can be labeled if no Glu and Asp residues are present in the peptide. Artificial amino acids containing a functional group that is orthogonal (non-interfering) to peptide functional groups can be incorporated during the peptide synthesis. Cys can also be added at the N-termini if no Cys residues are present in the peptide to incorporate a thiol functionality. CellMosaic has Personalized Conjugation Kits (PerKit™) for peptide labeling and conjugation, please click here to learn our PerKit™ product line. 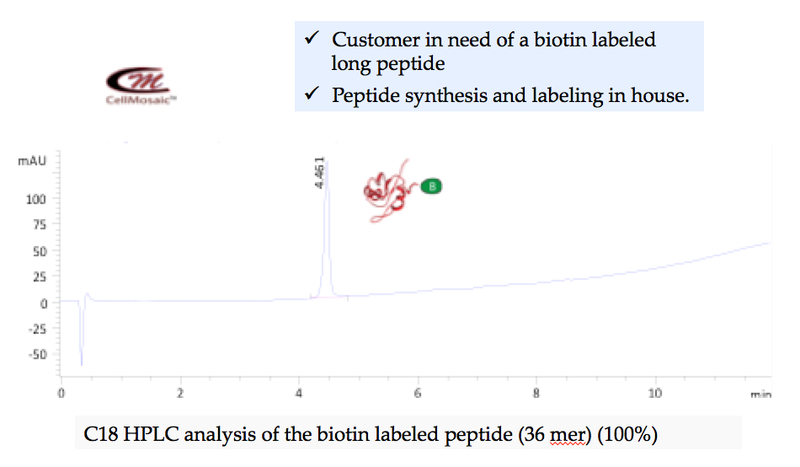 Biotin labeling of a peptide on solid phase peptide synthesis at CellMosaic (shown below): over 99.9% pure by HPLC. 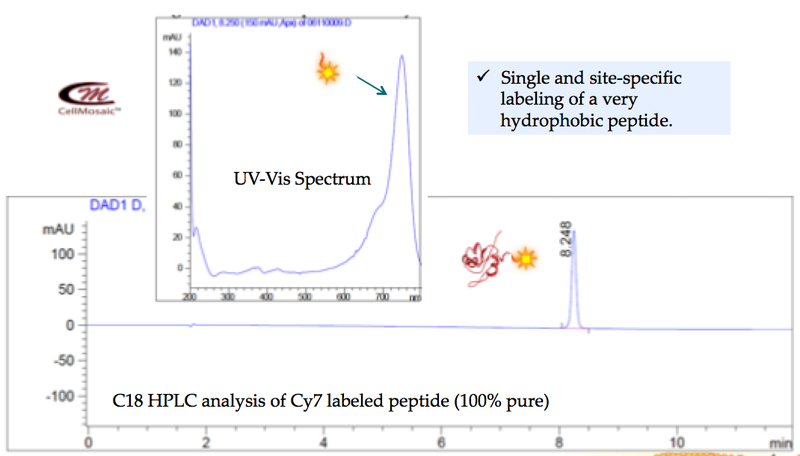 Fluorescent labeling of a hydrophobic peptide at CellMosaic (shown below): over 99.9% pure by HPLC. Click the button below to add the Peptide Labeling to your wish list.